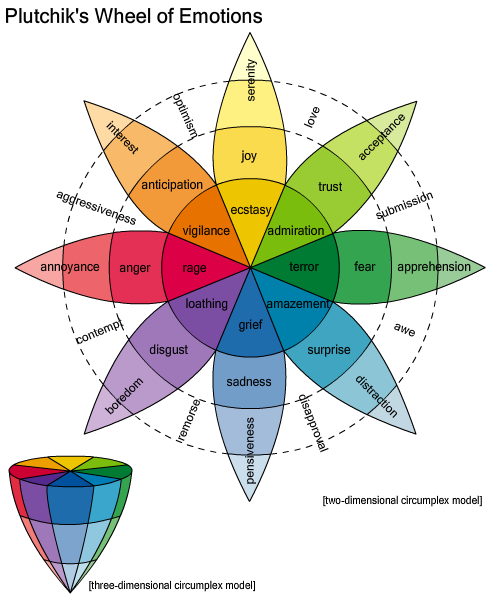 You are currently browsing the tag archive for the ‘Plutchik’s Wheel of Emotions’ tag. Researching some stuff for work I happened on a diagram that expresses a simple conceit: we all have 8 basic emotions and 8 advanced emotions (which are each composed of 2 basic emotions). Truth be told, I fell in love with this diagram because of its overt simplicity, complete fallibility and because PhD Robert Plutchick (God rest his soul) was so optimistic that he firmly believed the complex wash of human emotions can be distilled logically into a pretty flower (where rage is a petal and that petal is fuschia). I don’t think it’ll ever be that simple. That’s why people like being human. Maybe I suffer from a touch of synesthesia because I fell on my head when I was a kid but I’ve always thought of emotions as flavors. Like flavors, they’re hard to pinpoint and language tends to fall short when you try and express them. Even something as unmistakable as rage is different for everyone and it’s rarely as pretty as a tulip.